You are welcome on this great post. If you are a designer, photographer, painter, artist or a web designer then you are in the right place to choose the best portfolio WordPress themes for showcasing your creativity on the internet. After all, a well designed clean portfolio is the best way to show your previous work or history to your clients. Different types of portfolio page layouts: This gives you much comfort to use or customize the theme properly without having any problem. Masonry or grid style: This helps your visitor to stay your website with the varieties of the category. Portfolio Description: There are several people they don’t want to add the description to the portfolio items. But it’s important for your visitor to build a trustful relationship with you. So the portfolio description features is very important. Don’t neglect this step. Slideshow: This is very interesting things on the webpage. A creative 3D style slideshow increases the visitor interest. Parallax effect: This helps your website to look more creative and dynamic. Also, a smooth moving features help engage your visitor. In this post, I have listed some best portfolio WordPress themes. I’ve chosen those themes following some extra requirements. I hope you like every single theme from the list. Most of them are following the current Web Design trends to design their themes. Just take a look at this table for the extra requirements and quick guide. 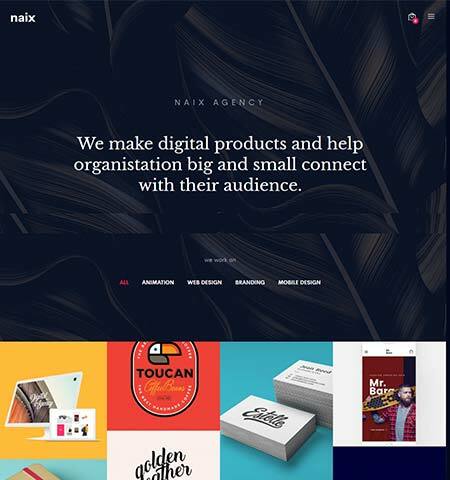 Naix is one of my favorite best portfolio WordPress themes. Personally, I take this theme top of this post because it’s unique concepts, moderns and impressive design. Mainly they focus on the portfolio showcase and user experience. This will help you to increase the rate of interaction with your users and bring more leads. It has some great features just check it out. 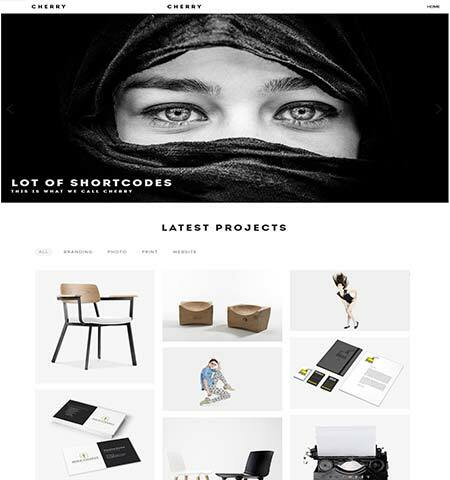 Kuverta is a Minimal Portfolio WordPress Theme. It’s very lightweight good looking clean professional theme. You can start your website within a minute with their great theme setup wizard options. It has some nice CSS3 hover effect and animation effect that catch your eyes. They include revolution slider and visual composer with this themes it saves some extra cost. It’s a creative portfolio website for photographers and designers. It has grid and masonry style with various gallery layout. Fully responsive retina ready display. There are several pre-build template that will help you to start your website very quickly you have to need just replace the content and image from the demo. It has jam-packed with splendid features. 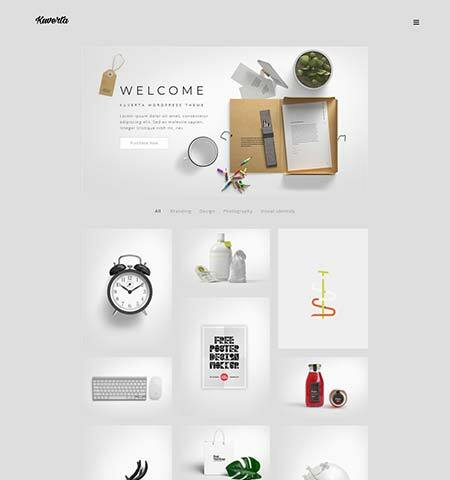 A minimal responsive best portfolio WordPress themes. It’s a unique, professional, high-quality, standard clean code theme. I choose this theme for its unique style that’s really awesome feel. You can use the Adam theme for your portfolio website, business website, agencies, photography, blog, shop etc any kind of topic. Because they build this theme with lots of variation. 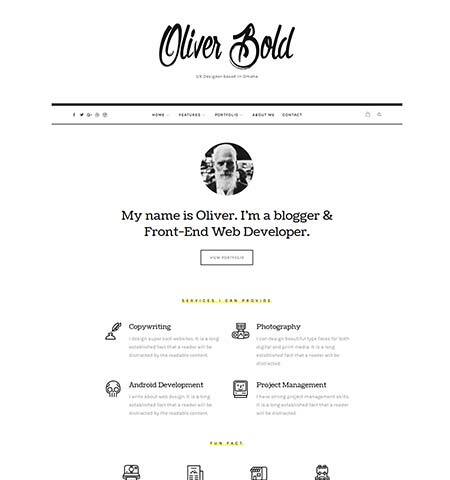 Oliver is a clean and classic modern personal portfolio minimalist WordPress theme. It’s a light-weight fast loading theme. You can use this one as a personal portfolio website. It looks pretty different not like the average theme. So let’s take a look some of the best features in this theme. If you want to use a theme in a various different website for different products then this theme is perfect for you. 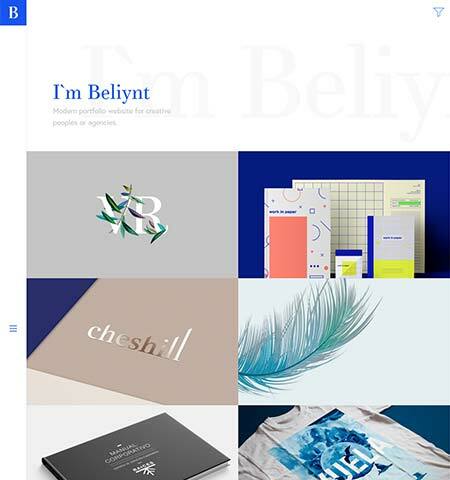 Beliynt is a multipurpose portfolio WordPress theme It’s easy to use and a very nice user-friendly backend that helps you to do any kind of change from the dashboard. Also, the loading speed is really great. 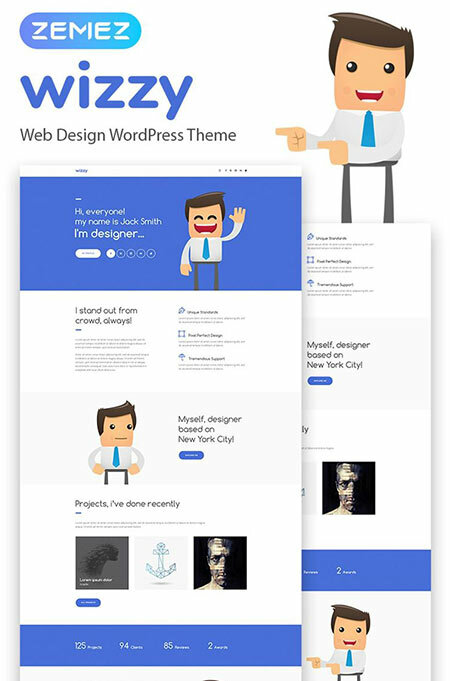 This theme specially builds for the developer, designer, agencies, creative people, and bloggers. This is really an amazing solution for your portfolio website to get started today. It has a great eye-catching visual stunning layout. 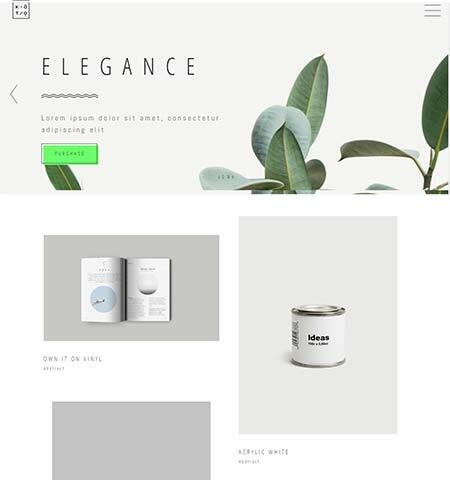 Cherry is a fully responsive minimal WordPress theme. If you are one of the minimal template fans then go ahead and grab this awesome theme. They build this theme, especially for minimal loving people. It’s very simple theme with some CSS# stunning hover effect also the loading speed is just awesome. Need to change your old website look ? or want to build a full new brand then Vision is perfect for you. This theme is build based on the Photographers, Resturant and other business teams who want to features their brilliant photographic content on their website. Vision is a beautiful, minimalist multipurpose Website template. Vision looks great on all browser and completely mobile device supported template. Are you looking for a multi-purpose Portfolio website? that you can use in a different day for a different kind of project. Then this could be your first choice. In this list. Master is a creative Multipurpose best Portfolio themes. 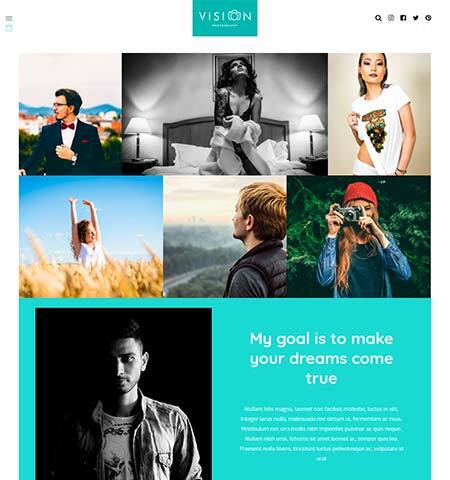 Using this master template you can create Photography website, Creative design website, Agency website and any type of portfolio or multipurpose website that you can create without any hassle. I personally love their eye-catching latest standard design pattern that makes it more creative and professional. There are lots of section if you take a look then you will understand why this is one of my favorite portfolio templates. However, this multipurpose portfolio WordPress theme comes with complete SEO optimize and Drag & Drop page builder features. They used most popular visual composer Drag and Drop page builder with this theme. 24/7 support and so many other features. 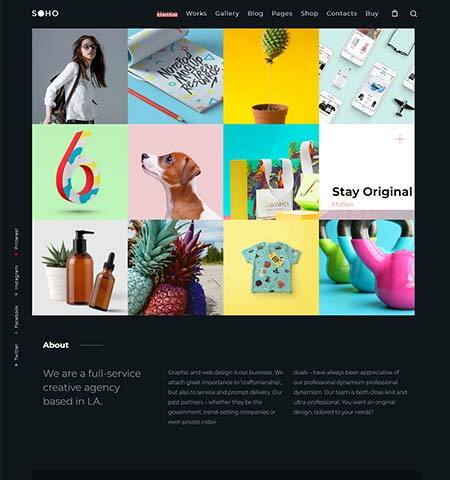 If you are looking stylish, responsive, unique design with black and white color features interior design template for your portfolio website or official website then this could be your first choice. It has good looking typography with bold looking font and layout that makes it more appealing. They build this template using the Bootstrap framework and follow the latest design trends. You can also use this theme to build your small online business website that greatly improves your online presence. Also, the backend part is more flexible for the webmaster or who manage the backend part. It easy to customize you can change any part or any section easily without having any trouble. It gives you much flexibility to change any part on this design. There is so many predefined layouts that you can use right away. Every single page design comes with a stunning eye-catching format that makes it more standard and more valuable to the customer. Wizzy is mainly built for the designers. This portfolio theme is perfect for any kind of design agency. 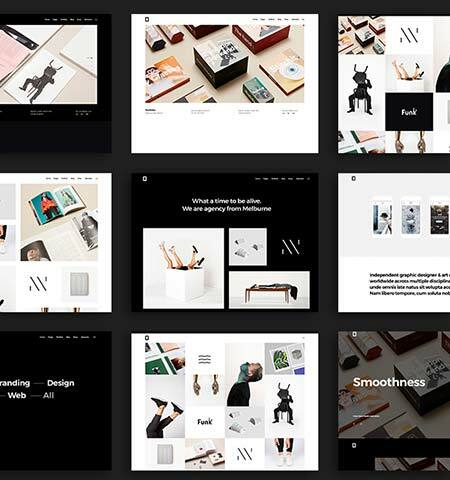 Wizzy is super simple stylish minimal looking portfolio WordPress theme. However, its a lightweight template that helps you to run your website very quickly on the browser. 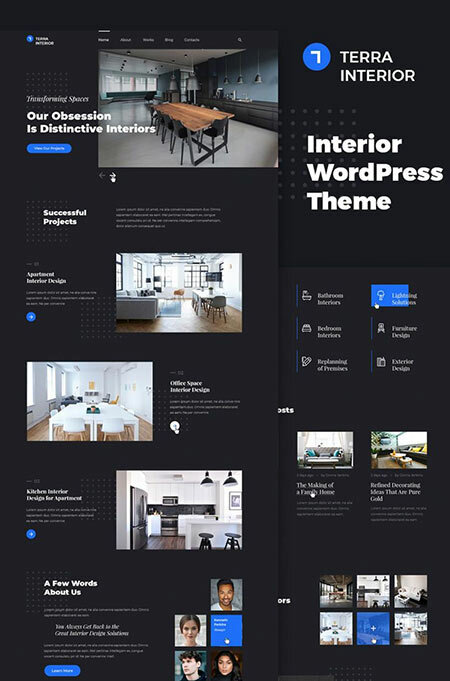 With this theme, you will get complete eye-catching stylish Home, about, contact, service, blog, portfolio, team member page and so many other necessary blocks for the design. It comes with a complete Drag and Drop features with a beautiful and user-friendly backend. They have a nice dashboard that will help you to navigate the backend part easily and also can change anything from the dashboard. Wizzy has so many images with the demo if you take a look on their demo then you will see that images. The great news is for the buyer if you buy this template then you will get all of those images and for free, with some more extra images that are necessary. and so many more features.. If you are looking a colorful, responsive, SEO optimizes with good speed optimize template for your Photography website then this could be your first choice. Your this Jhon Doe portfolio design template you can create your online presence easily within very short time. It’s a stylish and good looking photography template. It has nice css3 hover effect with slide popup menu. That makes this template more dynamic. There is a nice gallery with smooth lightbox style that helps your visitor to see your previous work continuously without loading the page or going to the next page. This template is built with elementor page builder that makes it more easy to customize. As a webmaster or a controller, you can manage this website easily. You don’t have to spend much time to do a little customization. It has a super cool and simple pricing table with a Booked Appointment plugin that is an extra bonus for you. Using this function you visitor can book their photo shoot date and choose the package from your website easily. 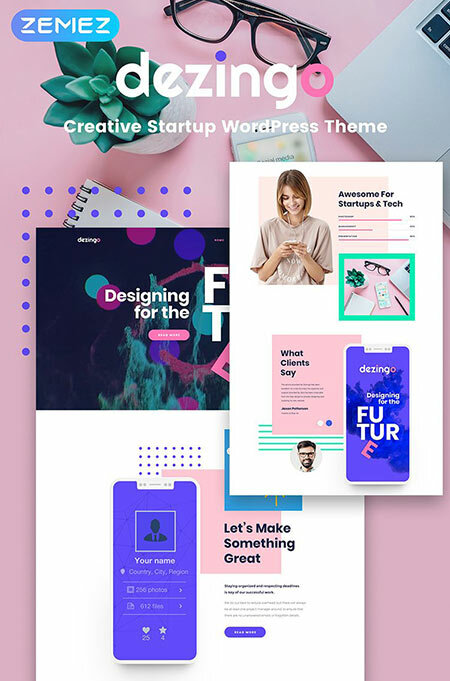 It’s an awesome, creative, stylish, colorful, unique startup WordPress theme. This is fit for any startup agency website or any creative firm. If you take a look on their demo page then you just fall in love with their creative stunning design. Dezingo is a bold looking creative template. I personally love their typography and beautiful custom shape graphical design in a different kind of section. This template suite for all occasions. The mobile first philosophy will make it more valuable and perfect for all other single devices not only the mobile. It supports all of the single device as well as the larger one! All images are free you can use them on your website without any copyright issue. However, they included jet elements plugin and jet menu that helps you to customize your website easily. 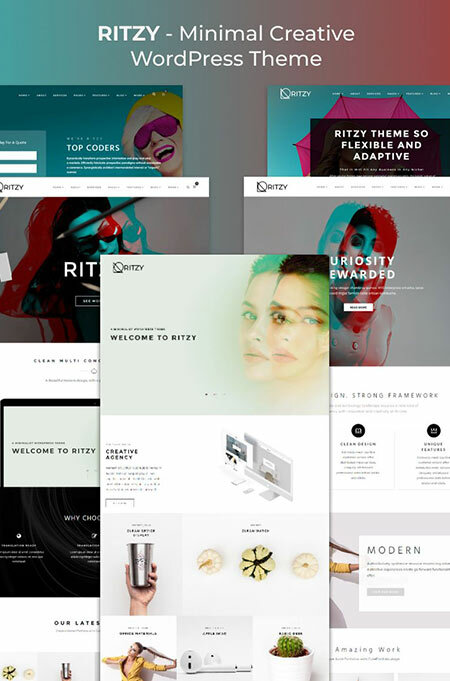 Ritzy is one of the most useful and good looking minimal layout creative portfolio theme. The design quality is a top class that makes this theme more valuable to the customer. This theme is developed by the RockThemes they have a good reputation in the marketplace. This theme comes with the variety of great plugins. The template meets the user needs who want to start their own business in the field of creativity. There no need any coding experience because of this template comes with most popular drag and drop elementor page builder. Ritzy has also JetElements addon for Elementor plugin which will help you to use various different kind of custom block custom layout on your website. Also, they have the bundle package system that enables your theme to add more pre-made layout from the page builder. However, if you want to create an online store then you can also use this template to create your new online store. Or directly you can sell your products through your current website using this template. CPM is a creative Photographer Elementor WordPress theme. This template is fit for all of the creative people.Using this great template you can showcase your work globally. That helps you to get attention and comments from different kind of people those are expert on this filed and also get clients. This is so important to you to choose the best template for your portfolio or showcase website. Unless you lose your visitor and value from the web. So you should think twice or more before choosing any template for your profession. CPM build based on the photography website. If you are looking photography template or showcase your creative work then this could be the best one. They have super creative animation and good professional high-quality design. If you take a look at their demo then you just fall in love with the design quality. There is some advanced parallax effect, Hover effect and animation effect that make this theme more dynamic and impressive. 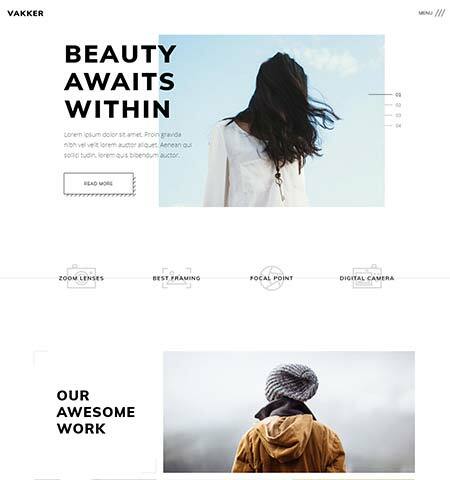 It’s photography website template. You can create any type of photography landing page using this template. Raymond Jones is very simple and easy to use. This template is specially built for those people who are looking very well design, Comprehensive, Versatile landing page WordPress theme. The most useful impressive feature is it supports all any kind single plugins with it You can create great eye-catching, unique portfolio website. This template is suited for any type of photographic images. It comes with a complete package including SEO optimize coding with great loading speed and a high-quality latest useful drag and drop page builder. However, you can create a professional blog page using this template. 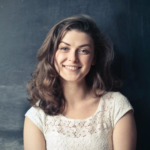 If you think you start writing your own blog then this is suite for your blogging profession. Pclick is a beautiful, stylish, creative and completely SEO optimized WordPress theme. This template is mainly built for Photography WordPress portfolio site. This template includes 2 most popular plugin the first one is Revelation Slider and the second one is King Composer. Using the Revolution slider you can create any type of slide in your webpage and place it anywhere. There is no limitation lots of features on this slider. And the second one King Composer this is one of the first and most popular Drag and Drop page builder. Using this page builder you can create any kind of awesome custom page design that gives you much comfort in the working session. So at the end of this point, this template you can use to creating travel photography website, Photography website, Wedding photography website and many more whatever you want that related photography topic. Don’t try to impress! 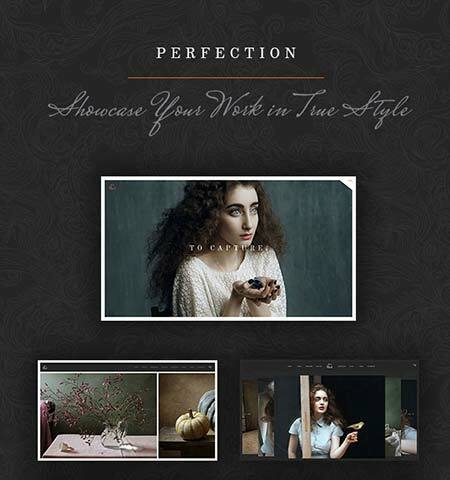 Become an Impression with a great, good looking professional stunning website. Magi is really a magical WordPress theme. 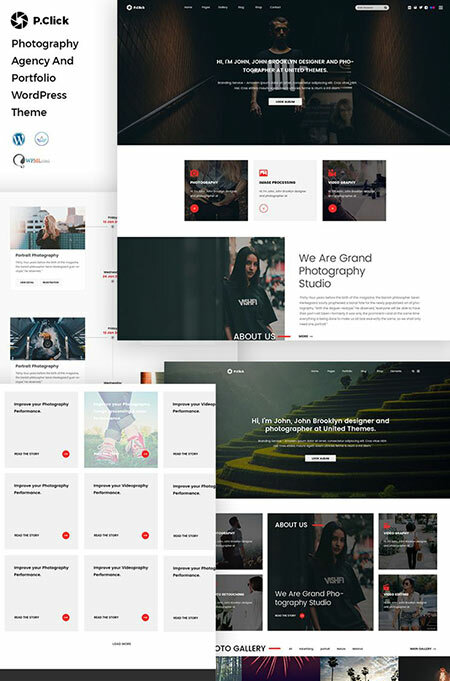 It’s a multipurpose WordPress template that means you can use this template any project for creating any kind of websites like portfolio website, Video website, Blog website, Agency website, Creative Portfolio website and many more. 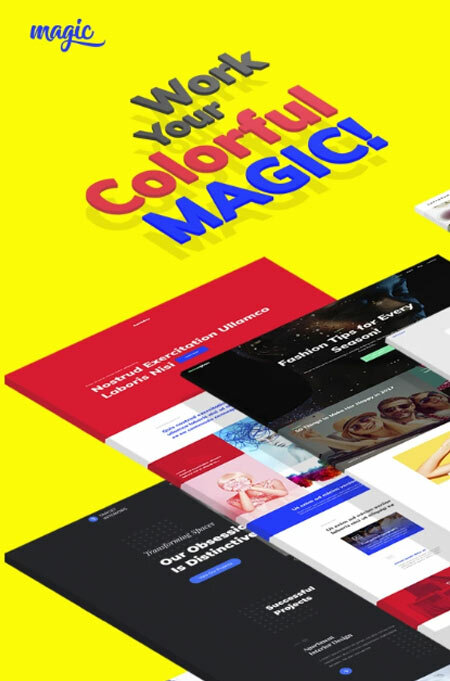 Magic comes with lots of cool and stylish colorful complete package template that saves you lots of time and help you to create a stunning eye-catching website. There is no limitation on this template. Whatever you want you can do using this theme. It has a great super powerful Elementor page builder with Extensive Modules with JetElements. It just takes one click for doing the whole process. It has included TM Wizard Plugin that saves your lots of valuable time. Because TM Wizard Plugin helps you to add all of the single necessary function easily within few seconds. 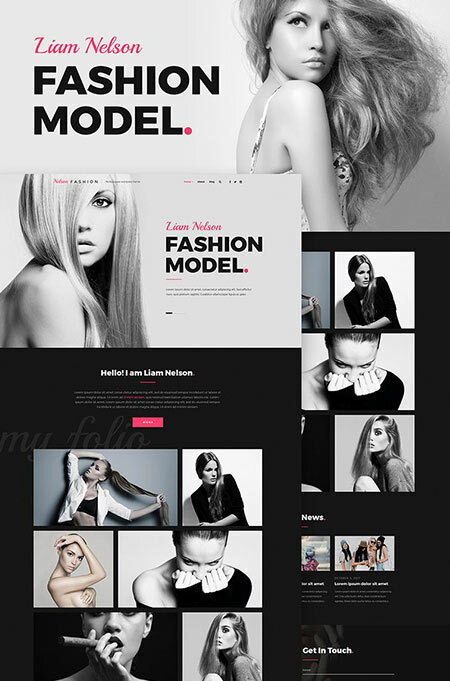 Nelson Fashion is model agency WordPress theme. 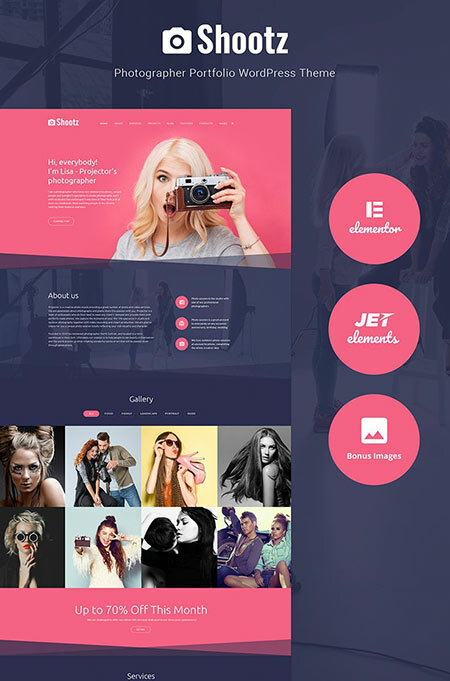 If you are searching and interested to build a creative fashion agency website for your client or for your personal use then this could be your first choice. It’s really awesome cool and super fast creative Fashion Designing Portfolio themes. It’s ready to go template you can start right now and everything is built in with this Fashion template. Your website will have a charming design with great loading speed. You can add testimonials section easily on this template that gives your present customers more value and trust. There is a beautiful newsletter feature that helps you to keep update your customer. When you publish new content or product on your website then you can easily send the new content to your repeat visitor who subscribes the newsletter. It comes with powerful drag and drop features that help you to do more in the backend part. So don’t have to worry about the customization part. However, if you are interested in writing blogging then you can also do and start writing your article on your blog using this template. It has everything that you need to run a website. This is a real deal for those people who want to save their time and money to create a professional high-quality Portfolio Website. This Flashing template take just a few minutes to run your website. Flashing is photography Portfolio WordPress template. It comes with beautiful typography with the unique eye-catching layout for all occasions. There are lots of graphical images and beautiful color combination that makes this theme more professional. A creative and eye-catching stunning design is most important part to engage your visitor and make them repeat. This Flashing theme follows this trends. They have created this template top quality design not only the design they follow carefully all over the single function on this theme. So that every important and necessary function are available with this template. Everyone like very fast loading website. No one wants to stay to see the loading icon into a website. This is a very irritating part. The flashing developer follows this rules properly and they are able to build this template with great loading speed. 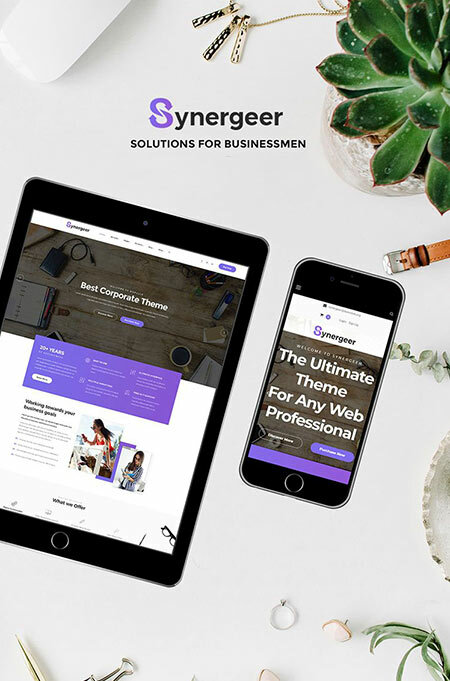 And many more useful features..
Synergeer is a beautiful corporate website template. Though you can use this template in a different way on different niche. They have that powerful features and functionality that allows you to customize this theme many different ways. It comes with full of incredible Functionality and great effective UI. That makes the user interface more user-friendly for your visitor to take a look every single corner on your website. Definitely, this type of functionality boost your audience and make them repeat. Synergeer has a beautiful slider and lots of different type of graphical image. Every section built very carefully and follow the audience interest. I personally love the color which one they currently use light gradient color features that makes it more standard. You don’t have to need any coding knowledge for using this template. Synergeer has powerful drag and drop page builder with thousands of customization features that help you to customize the template perfectly. 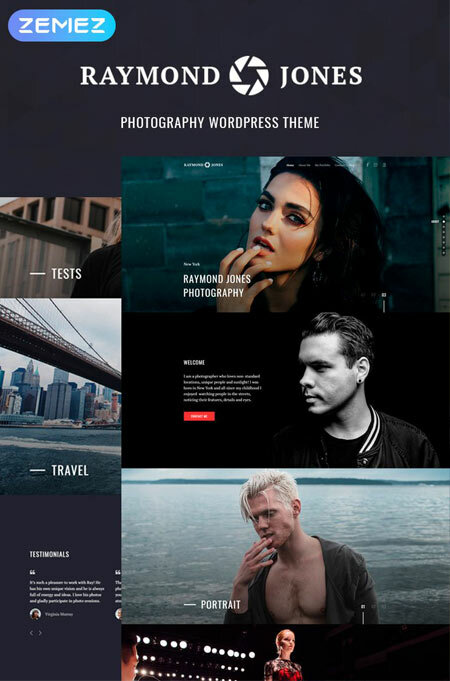 Hey, are you looking top quality, stylish, modern, transparent, colorful photography WordPress template for your website? Yes, you are the exact place to grab your template today. Shootz is highly professional Photography WordPress template for the photographers. 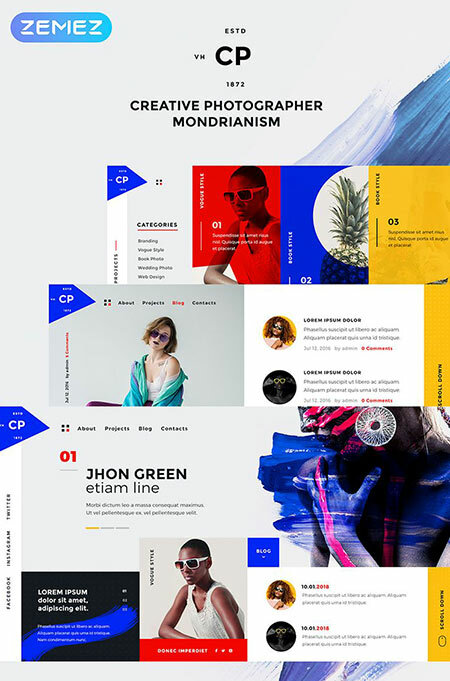 It’s a unique sunlight and colorful responsive template. You can use this template to showcase your video on your website. We think this is the best way to represent your talent all over the world. They mainly focus 3 items on this theme the First one is High-quality design, the Second one is loading speed and the third one is for user-friendly design. Shootz developed by an expert team their development method and all other single function is so useful. This theme offers that every you need to build a photography website. You will get all of the images free which are already on this theme. It a great news for you to save more money. You don’t have to buy the image for your website and no need hire professional to do the other work. 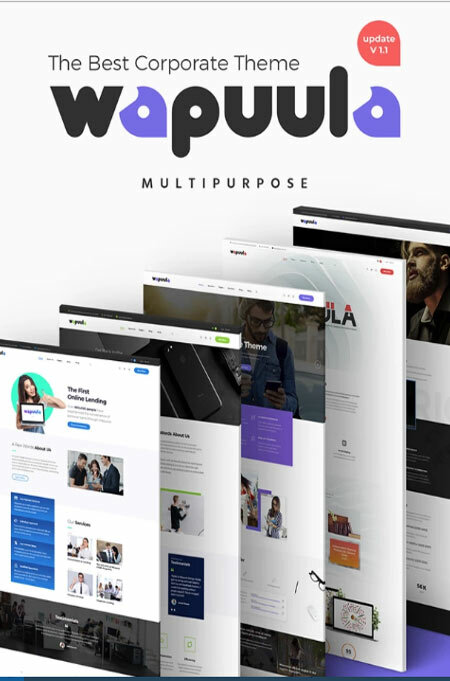 Wapuula is multipurpose Corporate WordPress theme. It’s one of the most popular templates in the multipurpose category. However, you can use this template for any type of project. Multipurpose means there is no limitation using this template. This template allows you to create and customize your portfolio website using full of your information. Wapuula has lots of quality and useful function. For this reason, you can create a different kind of company website beside portfolio website. It’s easily adjustable fast and reliable template that allows you to customize your every single page and post dynamically in a different way. Also if you take a look at their demo template then you will notice that they use so many colorful buttons and some advanced hover effect. Wapuula comes with most popular and powerful page builder Visual Composer which allow you to add the premade template for every single page and customize your website without zero coding knowledge. With this theme not only the Visual Composer you will get some more premium plugins and also, any kind of plugin working with this theme perfectly. Koto is a unique and inspiring portfolio WordPress theme. It has some great advanced animated features with modern typography. 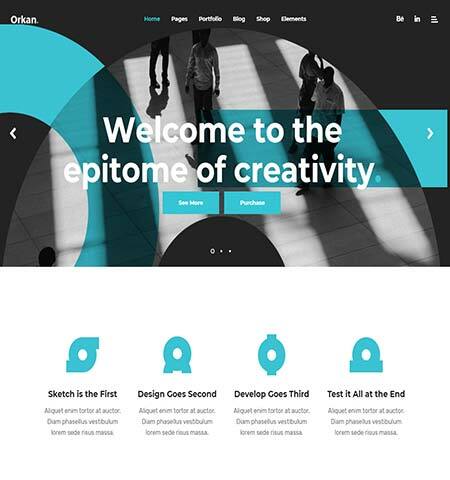 It’s a contemporary creative theme especially this theme is made for the designer and other creatives. They use some advanced hover effects too on this theme. It has several different types of single portfolio page layout. Vakker is a super creative and highly professional fully hand coded WordPress theme for the Designer, Developer, and Agencies. It has great UI that helps the visitor to stack on the site and play with them. If you take a look on this theme demo then you will understand. They used highly professional hover effect and animation effects on their theme. Personally, I just love their different type of dynamic hover effect. It has fully custom widget for the twitter and Instagram. Two free plugins the visual composer and Slider revolution. It’s an awesome, stylish, eye-catching portfolio theme for the designer, photographer, artist, and agency. Unlock your creative vision. It’s a perfect way to show your work to other with a clean and professional way. It has almost 20 gorgeous homepage layouts, each layout/ page design for specific look or category. You can use any of the demos which is fit for your needs easily on your website. You can add Illustration Typography, Photography and packaging video easily into the portfolio items. Orkan portfolio features are truly impressive. You can create your online shop using the theme and start selling today. So if you buy this theme then you will get everything that you need. 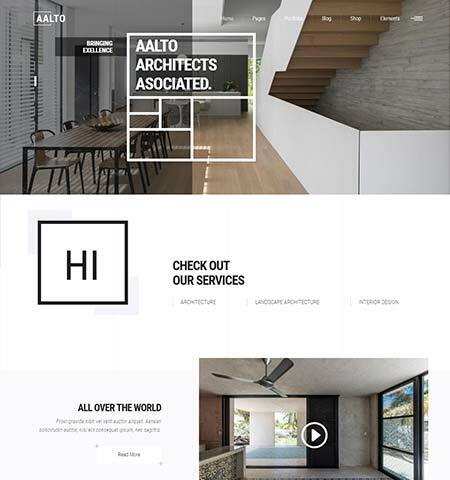 Aalto is an ideal choice for every architect.It’s one of the best portfolio WordPress themes. Everything you can showcase that related to your architect work on this portfolio theme. This theme has a wide range of variety portfolio lists with different types of slider and various single portfolio layout. 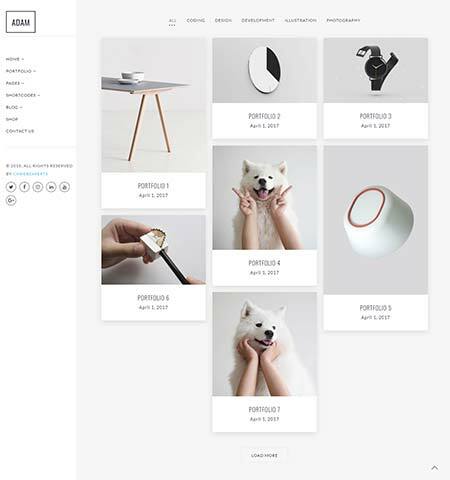 Aalto has integrated fully functional WooCommerce features into their theme. For this useful reason, you can showcase your product and sell them easily to other from your website. 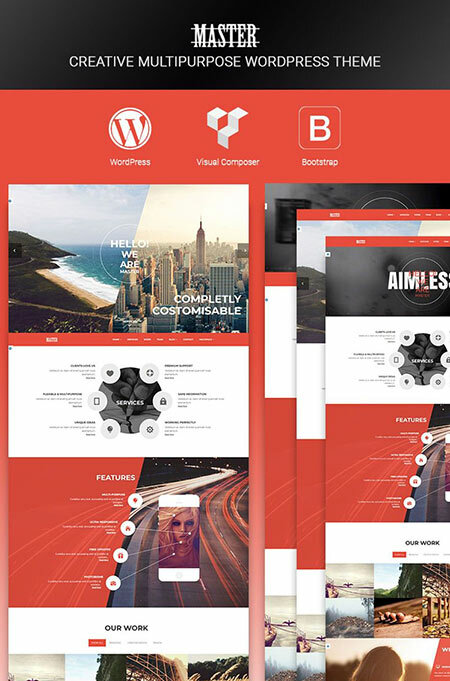 Bruno is a creative multipurpose WordPress theme. Thought it’s multipurpose but I added here to the portfolio theme list because there are some specific great features into this theme. Mainly it has great vibrant colorful options if you take a look at this theme demo then you will see the reason why I choose this one. 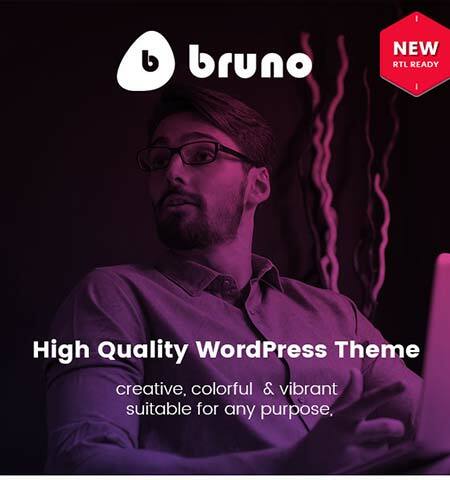 Bruno is not only a multipurpose theme but also a great portfolio theme for any type of category. This theme is perfect for the photographer. Lumière theme builds based on the photographer. It’s one of my favorite photographer templates. Highly customizable features, Extensive admin interface and a very simple one-click demo function. A big collection of the shortcode. Some of the best features are. Feel free to ask us any kind of question-related to this post. If you are confusing to choose the best one from the above best portfolio WordPress themes list then let us know. We will help you to provide you the best themes following your requirements. How to Hide a WordPress Page or Post From Search Engine? Blogs are not just for socializing with others but it can also give us useful information. like this just like me This is such a great list for choosing the best Portfolio WordPress Theme. Really the article is most effective for bloggers…….. Thank you for sharing this ” Top 30+ best portfolio WordPress themes in 2018 ” blog. Really the blog is most effective for bloggers to start their online career. Very helpful article.. Keep Sharing more best template for us. So that we can take a look every single new items.